We won't leave it all in our heads. We're not running now. 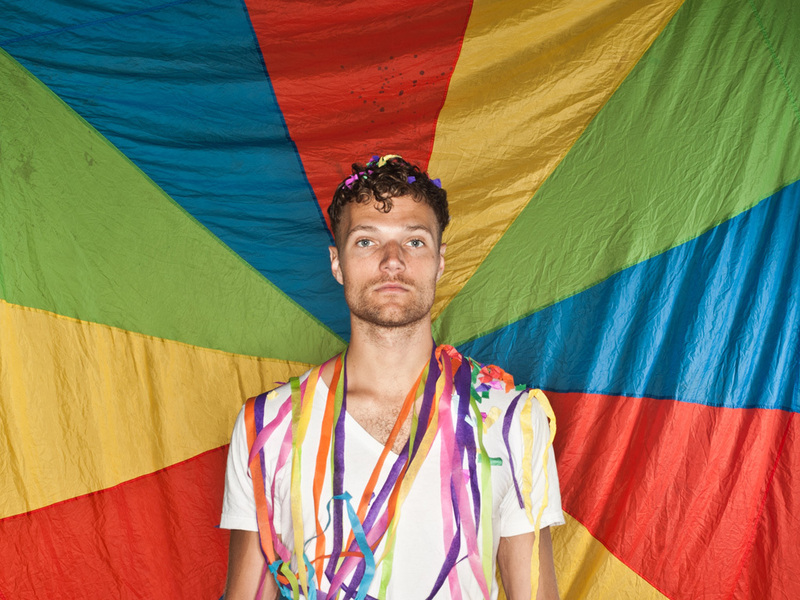 With a carnival spectacle of a live show, Halifax's symphonic-pop poster boy Rich Aucoin is a musical mastermind. Sing your swelling heart out, dance among a cloak of confetti, just don't stop the sonic alchemy. Part indie-rock preacher, part wonder-kind, Aucoin's We’re All Dying To Live (Sonic Records), is a musical scrapbook compiling over 500 musicians, friends and fans from across Canada. Produced by Rich Aucoin and Joel Waddell, mixed by David Wrench (Caribou) and mastered by Nilesh Patel (Daft Punk, Justice), We’re All Dying To Live is a testament to the metamorphic magic of music. “The record is really about making big life decisions or at least about thinking about those decisions and how to live one's life,” says Aucoin. “This is something that is very relevant to me as the lives of people my age are in so much flux.” Unlike his debut Personal Publication (2007), an EP that synchs to Dr. Seuss' How The Grinch Stole Christmas, We’re All Dying To Live is a very public affair. From St. John’s, NL to Dawson City, YK, Rich invited everyone and anyone who wanted to be on the record. From multiple choirs to some of Canada's finest musicians, we were all dying to sing. “I wanted to think about these things in the same way that I thought about love for the first record and make an album about these issues and topics,” says Aucoin. “Choosing to make such a collaborative record was such a great way to spend time with and learn from so many great musicians.” We’re All Dying To Live embodies the human condition, opening with pensive adagio “The Morning Becomes Eclectic Overture,” a preview of the epic musical journey to come. Sombre, almost mystical, Aucoin quietly asks listeners what is “All You Cannot Live Without, ” and develops into a magnificent cacophony. “It's a song about reflection on what you want out of life, or what you love most.” “Brian Wilson is A.L.i.V.E” veers from existentialism and recalls all we've been given, this kaleidoscopic track features an infectious bouncy children's choir. Before you wear out your dance shoes, Aucoin offers a reprieve “We're All Slaves to the Two-Four.” It's within these introspective snippets the album reveals itself as a narrative of heart, heroism and hope. For instance, “The Little Creatures Know” is a reference to a chapter in Douglas Coupland's Life After God. This is the frame and inspiration for the following songs “It” and “The Greatest Secret In The World.” If the single “It” doesn't have listeners crossing their heart, hoping to die, repenting “we won't leave it all in our heads,” consider them beyond saving. This topsy- turvy dance track could save the world. If musical smack down “Watching Ice Station Zebra For the 151st Time,” doesn't prove it, “P:U:S:H” permeates it: “I became obsessed with Howard Hughes and the film Aviator while making this record. I'm not sure which I was more obsessed with, but in any case it was a great motivator to keep working hard when I got tired.” Aucoin goes above and beyond into the ether, only to round the corner with “We Must Imagine Sisyphus/Ourselves Happy,” a carousel ride of sentiment. “It comes from Albert Camus' existential essay on Sisyphus. I added the “Ourselves” to emphasize that we are just like Sisyphus, eternally pushing up and down a mountain for our entire lives.” The gritty rock interlude “1929-1971” prepares us for our next lesson. “Watching, Wishing, Waiting” could send anyone back to school. But there are no more teachers, we've got to save ourselves. The two part duet with Rebekah Higgs “Undead Pt. 1 – Estrangement” explores all shades and shadows of the heart, bursting into “Undead Pt. 2 – Reconciliation,” a climax of soaring trumpet, drum beats and the declaration: “we are not dead yet, we are undead”... a song about mending relationship which have fallen apart. “Watching Herzog and Listening to The Idiot” allows listeners time to soak in this truth. Colourful and dreamy, “Living To Die” soothes, while piano ballad “Dying To Live” brings together a choir of voices reciting the chorus over and over: we're all dying to live. This gorgeous send off closes with the final track, “500 People Talking,” where hundreds of voices fuse together in post-party conversation as if it were the last night on earth. Much like the makings of We’re All Dying To Live, Aucoin wants to be surrounded by everyone he knows and loves and everyone he has yet to know and love every night forevermore. Cash in your golden ticket to an all inclusive electro-pop dance explosion.